When I first thought about doing sustainability posts two names came to mind; Auntie Blanche in the human category and Frank in the dog category. I have trouble understanding people who don't want and enjoy pets. One of the many reasons is that if you don't love pets you're going to miss out on meeting a dog like Frank and that is a tragedy. 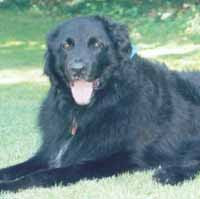 Frankie was a mix; surely some newf in there, probably some lab and maybe some other sort of retriever. He was owned by a man who, I believe, went to jail leaving the dog in the apartment he shared with his girlfriend. The girlfriend didn't like him so she turned him out of the house. Frank stayed there, next to the door of the building, waiting while the people he cared for wandered in and out completely ignoring him. Neighbors fed him for six months before they took him to a groomer then took him in while they searched for a more permanent place for him to stay. At that point he went to live with Carmencita and Carsick where he showed his true colors. He was simply faithful, kind and true. When someone he loved (especially Carsick) came back after an absence he gave a crazy rooing noise that sounded exactly like Chewbacca. Late in life, when he struggled to rise on his own, there was someone creepy hanging out around their house. Frank stationed himself asleep by the front door, which was see-through. When the person got too close Frank raised his big head into sight and gave a couple of his deep and rich but rare barks. I was lucky that Frank loved me as much as I loved him. We spent a lot of time together and sometimes if I'd been gone too long I'd even merit the wookie noise, which was pretty much his highest compliment. One night I was invited over to watch some basketball playoff action. The family was upstairs in the parlor so I entered on the lower level and went up. Frank was asleep. I sat down and we watched and talked for about ten minutes before Frank woke up. The next words I spoke made him bark his intruder alert unceasingly while he worked to gain his feet. No amount of verbal reassurance would soothe him as he stalked toward me on unsteady, old man legs. About halfway across the room he must have recognized my voice or scent and realized it was me. Have you ever seen an embarrassed dog? It's hilarious! He shuffled toward me, abashed, and gave me a strong newfie leaning hug. Poor dog, we could not stop laughing. A combination of arthritis, fused spinal discs and degenerative nerve disease lowered Frankie's quality of life in later days. He was a trooper, though, and, like Emily, was always willing to do whatever kept him closest to his people even when it hurt. One day I was crossing a relatively busy street and I misjudged the traffic in relation to Frank's slowed gait and was urging him across with leash and voice, afraid that he might get hit. A woman was crossing the sidewalk toward which we were headed and she was staring at us. As we got close she pointed a slightly panicked finger and said, "Uh...his collar, his collar!" As he gained the curb I looked to see that, in my excitement, I'd pulled his well worn leather collar up over one ear. I thanked the woman, adjusted the collar then apologized to Frankie. While I did I was thinking, "Lady, if this dog suddenly rose up, yanked off his collar and chased you down the boulevard I'd give him a whole sleeve of Lorna Doones and the world's longest tummy rub I'd be so happy he was better." But he didn't and we continued on our way. In the end Frank died on April 13, 2001. I went over to dye some Easter eggs on the 12th and Frank stayed on the floor in the office all night. Near the end of the evening Carsick told me that the previous day they'd made the decision that Frank's bad days were nearly constant so they'd made an appointment for the 13th for the visiting vet to give him a compassionate end. That morning Frank had woken up in the kitchen, not been interested in eating, walked into the office favoring one side in a way that indicated a probable stroke, then laid down on the floor and he hadn't moved since. I feel as though he let them know, in as clear terms as he could, that their decision was the right one at the right time. A kind dog is what I'm saying, so kind. I've been reading a lot about atheism lately. It's certainly got logic on its side and I want to be able to commit myself to it but little things still bother me about it. One of those things is a picture that I can't shake that, when it's our time and we're waiting, confused outside the door of our home, it will be Frank who takes us in and feeds us Lorna Doones and rubs our tummies until we feel comfortable again. I can't buy atheism. I just get too many signals that there IS more than what we see here - there may not be one big GOD in charge, but there is most certainly another side. I truly believe that EVERYONE we love who goes before us will be there to greet us when we arrive. I imagine you'll get to hear the wookie noise again. I love animals, too. Especially, my cats. But, I cannot have them anymore due to some real horrible allergy problems. I am longing for a pet right now, but cannot do it. I would bring the first one home from the shelter that I touched. beautiful post. I'm with chili...there are too many blessings and beautiful things such as frank, and em, and stormy and kikimama and sammy, for me to believe that it's all just some sort of random yatzee...and you. you my dear and the best blessing of all. aw, he sounds like a wonderful dog. It's tough to watch an animal get older, but it's a part of the process. Sounds like Frank lived his life with dignified class. Count your blessings for your time with Frank. I love dog energy and borrow some any time I can. It never ceases to amaze me that we can do for our pets (a helpful medical ending) versus what we can't do for the people we love, there are not as many options. It's always hard, but enjoy spending some down time remembering your hugs and cuddles and sniffs with Frank. Thinking of you both. "I have trouble understanding people who don't want and enjoy pets." I don't understand that statement. I like chocolate, my Honey doesn't. I don't waste any energy trying to understand that. People differ. Some folks find their own preferences to be transcendental or something, like George Will rhapsodizing about baseball. I don't really think, when it comes to liking/enjoying things, that there are things we "ought" to like. I suppose what I'm saying is that I don't like the feeling of being "judged" by others on whether I'm a "pet" person. Oh, I don't specifically mean you, as I understand you to mean that so much joy and pleasure comes to you from animals that you wish the same for everyone. I have actually been told by someone in the past, someone whose opinion I valued up to that point, that she thought there was something "wrong" with people who did not keep animals as "pets." I figured if she thought something was wrong with me, we really didn't need to associate, and I ended the relationship. Great post. You can embrace atheism and still believe the last statement of your post and still believe that there is something after you die. I certainly do. I just don't believe in a god or gods. That's all it takes to be an atheist. I do, however, believe that the whole universe is divine and I do believe that your soul continues on after you die, but I don't believe in heaven, hell, or a god orchestrating it all. Heaven and hell are here on earth. Hopefully I do more to make the place heavenly than hellish! There are atheists who don't believe in anything divine or "supernatural," but it's not a prerequisite to being an atheist. You can be spiritual and be an atheist, you just can't believe in god. I love sweet old dog stories. My experience with atheism hasn't been that spirituality is encouraged. The thing that Julia Sweeney said that stuck with me was (paraphrasing ahead! ), "Why do we need to believe that there is a god or goddess or plan or other out there making all this happen? Why can't it just be us making it happen? Why is it so difficult to believe that we are capable of these great things?" That pokes at a lot of my buttons about leaning on crutches and religion (even spirituality) being a crutch one constructs to limp along with this deficiency instead of realizing oneself as a whole. I don't KNOW, though! It's just stuff I think about. Seester, I struggle with every e-mail I get and ad I see and listserv that finds me. It was anguishing to surrender Pickle/Lorry even though it was the right thing to do and if she hadn't ended up with friends I would have regretted leaving her every day. I dodged a bullet there. Kitty, Frankie was a super classy nerd of a dog. He was like that Leonard character on Big Bang Theory. Laurie, it's absolutely unfair that we can't give our people the same consideration, I agree! A lot of atheists aren't big on spirituality, but that doesn't mean that YOU can't be an atheist and spiritual.